I got a special request to make these. My Uncle saw it and posted the link on my wall for Thanksgiving, which we wouldn’t be home for. I thought it was cute and forgot about them, but as Christmas got closer my mother informed me that my Uncle had hinted that he sure would love to try one of those apple pie apples….wink wink, nudge nudge. Of course, after looking them up to find the directions, the first thing that pulled up was a link to a “pinterest fail” with a picture of how it looked on pinterest (perfect little apples, browned and round) next to the “my attempt” picture, which looked more like the poor girl put mini bombs inside of each apple because they had literally exploded into a big mushy mess. Needless to say, I was a little worried as I embarked on making these myself. Luckily, they came out beautifully and were delicious (plan to put a scoop of vanilla on top if you have the chance!) although they don’t keep well so cook them accordingly so they can be eaten within a few hours of being out of the oven. Rumor is you need to keep an eye on them and don’t over bake, I believe that’s when the explosions occur, as the apples get too soft and you’ll end up with apple sauce. The recipe is per apple, which gives you the flexibility of picking the number of apples you want to do. We did 8, 4 granny smiths and 4 fuji apples. 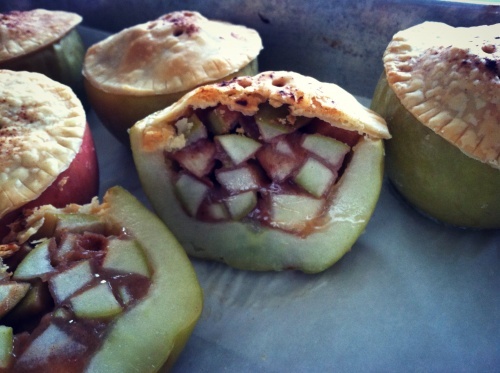 The best types of apples for pies are granny smiths, braeburn, fuji, and pink lady apples. Some less easily available but delicious choices if you can find them are jonathan, jonagold, pippin, and gravenstein apples. Some to avoid are red delicious and golden delicious, gala, and cortland, since they tend to become mealy in pie fillings. I baked these right after flying in to my mom’s house the night before Christmas Eve, so I opted for a premade pie dough in the refrigerated section and it made this recipe even easier and was delicious. If you have the time, try out making your own dough which I will post below as well. Slice the top of the apple off, about the top 1/3. Dice up the top, removing the core/stem. I left the peel on. Place in a small bowl, adding the sugar, flour, and cinnamon. Stir until well coated. If you are feeling adventurous, maybe try and add some caramel. And let me know how it works out. Using a large spoon, gut the bottom 2/3rds of the apple. It was easiest to stick the spoon in and carve out a circle, then kind of scoop/leverage the center out in a couple pieces. Make sure to leave the outer shell of the apple thick enough to stay stable (1/4 – 3/8ths thick). Spoon the diced up mixture back into the apple, it should just fit or you may have some left over. Allow it to mound up at the top some but don’t over fill. Unroll the refrigerated pie crust or make your own dough and roll out. Use a cookie cutter or the lid off a peanut butter jar or a large coffee mug (whatever you have on hand) cut out circles of crust to just cover the opening of the apple. Using a straw or a knife, poke out holes or make slits in the circles to allow some venting while baking. I also made little edging indentations to make them look cute, and sprinkled a little cinnamon on top. Place on a baking sheet (I used a casserole dish with higher sides to make sure they didn’t roll away in the oven) lined with parchment paper. Bake for 40 minutes, until crust is lightly browned. Check earlier to ensure optimum explosion avoidance. Top with ice cream if you dare and enjoy!